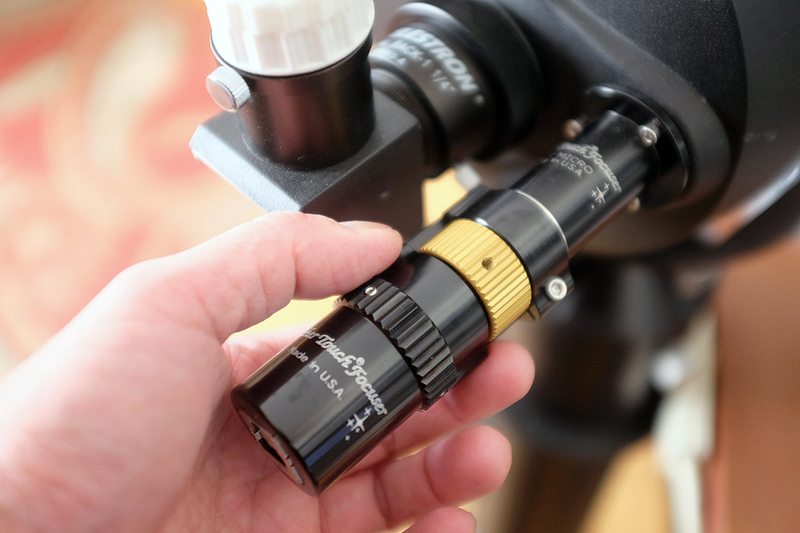 In the last post in this series we showed how to replace the manual knobs with the motorized focuser. Now we will show how to complete the setup of the remaining pieces Starlight Instruments Focuser Boss II Kit (hub, hand controller, etc). We don’t have the pin-out for the cables, but they all look like standard cables. However, should you require a different length, before swapping them out, we would suggest checking with the Starlight folks so you don’t accidentally fry anything. 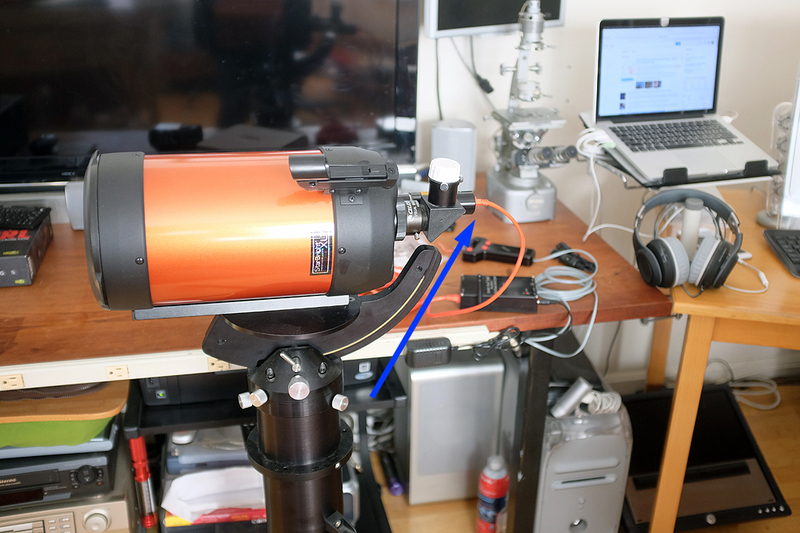 With all the ports of the Hub conveniently labeled, how things connected up was pretty obvious (fumbling in the dark is never fun)….the Orange cable connects the Hub to the motor on the telescope, the gray cable goes from the Hub to the Hand Controller, and the AC adapter plugs into the 12VDC socket. Easy peasy. With everything connected up, all that is left is to get the software, drivers, and WiFi connections are sorted out. 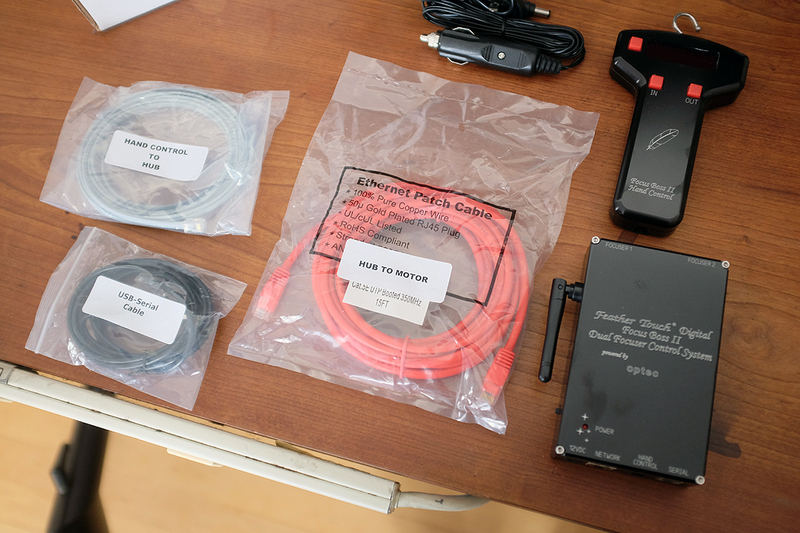 Once done, this scope will be ready to be remotely controlled from the INSIDE…with an app!!! BTW…the Serial port talks to the computer via USB, the Network socket is for an Ethernet connection, and the antenna…you guessed it…WiFi! Oh yeah…there is another Focuser port at the upper right, so one Hub can control focus motors on two different telescopes! 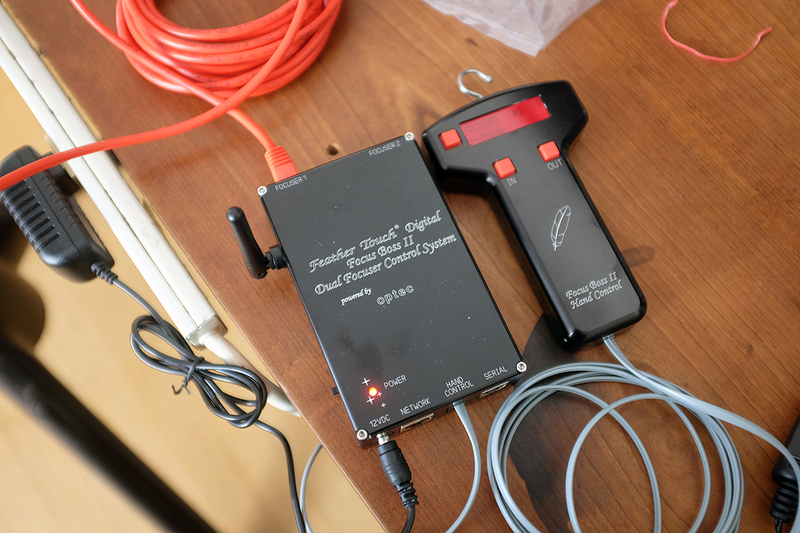 Next on the ToDo list is to run some diagnostic tests to make sure we can properly control the focusing via the remote controllers (wired and wireless). Once we are satisfied, we will then move on to installing and getting the computer control software up and running. It is going to be pretty cool when this is up and running!